The MapImagery Encryption software is protected via a software based licensing system. Normally the application can talk directly to the MapImagery license server on the Internet. If your PC does not have a connection to the Internet, it is also possible to obtain and return licenses manually via a series of web pages. 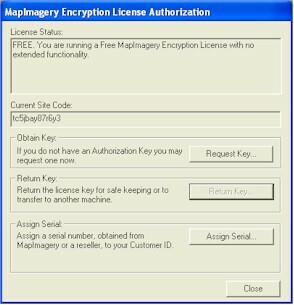 You can invoke this dialog, by pressing the Licensing... button on the MapImagery Encryption dialog. This dialog shows you the current license status of your PC, the Current Site Code and also is the access point to the other licensing functions, Request Key... and and Return Key... The first snapshot shows how the dialog looks when you don't have a license. The second snapshot shows how the dialog looks when you have a valid license. 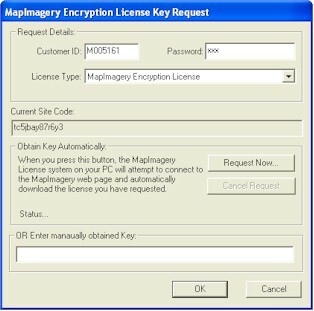 If your PC does not currently have a valid MapImagery Encryption license, the enhanced features of MapImagery Encryption will be disabled, and the program will revert to the standard free features of MapImagery Encryption. Normally all you need to do is enter your Customer Id and optional Password, choose the appropriate license type and press the Request Now button. This will attempt to fetch a license from the MapImagery license server on the Internet. 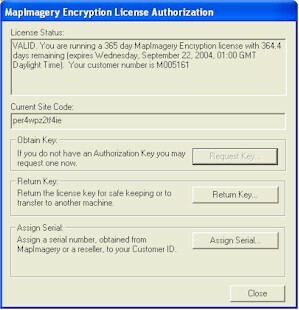 You can return a MapImagery Encryption license to the MapImagery license server for safe keeping, to transfer to another PC, or after a license has expired, so that you can request another license. 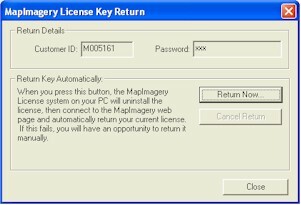 If the application is unable to connect to the MapImagery license server on the Internet, you will be given the option of returning the license manually. A secondary licensing scheme employed in MapImagery Encryption is that of the MapImagery Encryption Vendor Profile, which is a file with a .MIV extension, containing the Organisation Name and Contact Details of a Vendor licensed to create .MIE encrypted files. A default Unlicensed.MIV file is shipped with MapImagery Encryption. This vendor profile can be used during evaluation and testing. The contents of this profile is shown below, and can be found in the MAPIMAGERY\mivdb directory (typically C:\Program Files\GID\MapImagery\mivdb). If you are a fully licensed Vendor, then you will be issued with a YourCompanyName.MIV file, which you should save into this directory to be used by the MapImagery Encryption Server tools when creating .MIE and .MIK files.